Get ready to step into another place and time when you meet Alice, who will take you and your guests into the Party Palace for a terribly elegant tea party, with organic rose petal tea, served on the very best china, of course. When you have finished your tea (learning oh so proper tea etiquette as you go), it is time to test your knowledge of the world of Alice. The Mad Hatter has left a basket full of games. Be prepared to use your imagination! 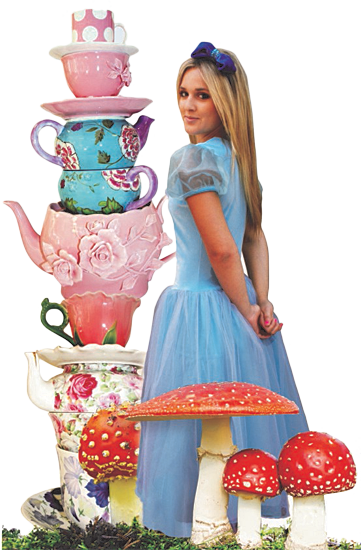 Naturally, you will want to wear your best tea party frock or perhaps dress as a character from Wonderland. Most suitable for ages 7 and over. Younger siblings who want to attend are welcome and will have their own special sparkle cup and plate, but will need the supervision of an adult, because of the hot tea and fine china on the table. Grandmother, mother and daughter gatherings are also a fine idea, bringing together all the girls of the family for high tea with a bit of shenanigans!